Goldsworth manufacture height adjustable HTM64 compliant single or multiple height adjustable sink units for manual cleaning of both instruments and scopes. Optional washing spray guns can be supplied. Bespoke stainless steel height adjustable sinks are designed and manufactured in our factory to suit specific applications. We work closely with our customers to ensure that we produce quality manufactured height adjustable sinks to exactly fit into the available space. Goldsworth manufacture static height HTM64 compliant single or multiple height adjustable sink units for manual cleaning of both instruments and scopes. Optional washing spray guns can be supplied. 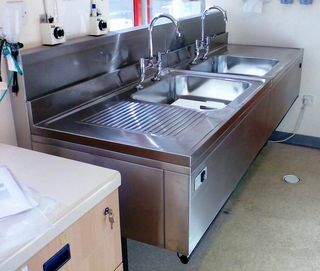 Bespoke stainless steel static height sinks are designed and manufactured in our factory to suit specific applications. We work closely with our customers to ensure that we produce quality manufactured static height sinks to exactly fit into the available space. The stainless steel housing assembly that contains the Chemical Dispense System is mounted below a draining area (left or right) of Item 1 above. It is supported in a sliding housing for ease of access but is flush with the front of the sink unit. Overall dimensions are less than 400 wide x 400 deep x 500 high. The housing contains a 5-litre chemical bottle with all the other associated equipment including the pumps, valves, tubing and related components with a sealed base to contain any spillages. Changing bottles is a simple process. There is a Discharge Inlet fitted to the side of a Sink Bowl, which has facilities to monitor, and control chemicals injected directly into the sink below a preset water level. This unit also contains a thermocouple for measuring and monitoring water temperature. This unit is sealed internally using a chemical resistant ‘O’ ring. 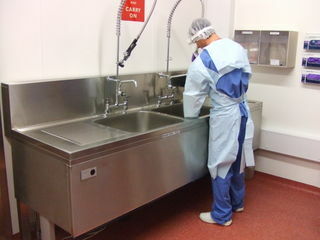 The Sink is engineered with a recessed hole, similar to the waste, for securing and sealing the unit. The Control Unit is combined in the front of the Sink Unit above so that there are not any cables or tubes draping over the sink bowls. The unit operates at 24v. Temperature readout, with over-temperature readout and non-function of chemical dispense if outside limits. 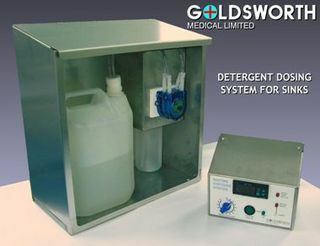 Dispense rotary switch for pre-determined quantities of discharge relative to quantity of water in the sink. A secondary small ‘sump’ bottle, which will act in the infill line containing a final chemical charge when the 5-litre bottle is empty. Sensors and controls to advise that 5-litre bottle requires changing. All interconnecting cables are provided for a complete working unit, which is tested and CE certified. 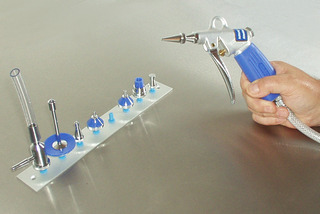 Spray Gun Rinser for use with hot or cold soft water or compressed air are used to assist cleaning items prior to washing, disinfecting and sterilising.A variety of replaceable tips and nozzles are supplied for the various cleaning purposes, including trays, surfaces, pipettes, catheters, syringes, tubing, bottles and Erlenmeyer flasks. Non abrasive, food grade, silicone free, CFC free cleaner that cleans, polishes and protects, restoring the original lustre to Stainless steel surfaces. Also lubricates hinges, etc.